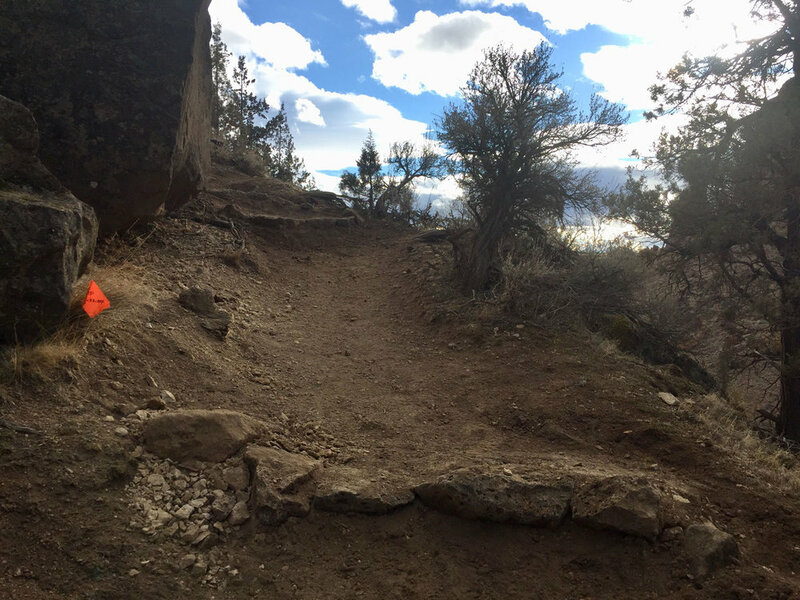 If you haven’t been there lately, rock stairs were put in over a year ago by the bench that was added at the viewpoint before you descend into the park canyon from the Turnaround Parking Lot at the Northern Point. The work done in the past couple of weeks extends those efforts to add more reinforced steps in place of rough scree patches and trail holes. We took pictures from the other direction, first descending into the canyon from the Overlook near the Welcome Center yurt via the Chute Trail. The Homestead Trail starts to the right before crossing the footbridge. Taking it around the Crooked River, you come to a sign that points you to a steep trail with switchbacks that takes you out of the park to the Turnaround Parking Lot. Approaching the Monument Area that lies on the other side of the river, the Homestead Trail signage directs you up to the switchbacks to exit the park via the Turnaround Parking Lot. As you rise up the switchbacks, you come to a bench offering a viewpoint of the canyon below and the Monument Area to across the river. Leaving the bench area you come to the original sets of stairs put in over a year ago. A new set of stairs serves to keep the erosion at a minimum. More of the steps put in earlier. A final set of new steps. And the final path out to the parking lot of the Homestead.